Jacob Kurek, Principal Middle East, Partner Architect Henning Larsen Architects tells us about the studio's most recent and interesting designs. From Calabar International Conference Centre in Nigeria to the new masterplan for Vinge, urban development north of Copenhagen, including Henning Larsen Architects' new interests after the death of its founder. Henning Larsen, founder of Henning Larsen Architects, died on June 23 2013. What has changed about you since then, and how have you developed the great master's methods over the past two years? Henning Larsen’s influence on architecture was significant. He established a culture in the company that is driven by high artistic and professional ambitions. His notable curiosity was and still is shared by employees and partners alike. So in all respects this is a driving factor for the development of the architecture we create. We believe that this forms the firm’s DNA and legacy. Part of that legacy is our ambition to design in an environmentally conscious way and integrate energy-efficient solutions into our projects. It is important for us that the work we do has a high degree of social responsibility. Our approach to the design process is therefore holistic; not only are materials and production sustainable, but we also aim to create good, social and community-creating spaces. In our last interview with Floornature we talked about a project you particularly loved, the Calabar International Convention Centre, in southeast Nigeria, which had won an international competition on invitation. In view of the political, social and cultural difficulties in Nigeria in the news today, and considering the desire for renewal that had characterised Nigeria until the recent terrorist attacks, what is your experience with the development of this project of great cultural value for the city of Calabar? We take on projects in many countries and, as with all our buildings, we are constantly aware of the potential impact on the context; both at a regional and national level. We want to be working in places where architecture makes a difference and can add value to a community and to a region. You could say that the firm is driven more by typology than geography in that respect. The Federal Republic of Nigeria, being the most populous country and largest economy in Africa. If you take Cross River State—where the Calabar project is located—it is very peaceful and stable. Two-thirds of it is rainforest and the citizens are optimistic and forthright. It is truly a fantastic region in which to place a building for cultural and business events. 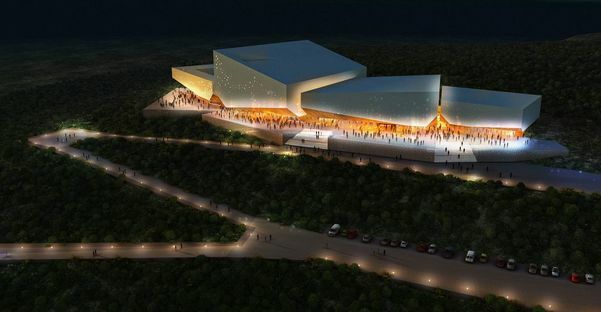 The convention centre is multi-functional, and will offer the citizens of Calabar a new cultural centre while attracting more international business travellers and tourists to the area. The area holds great potential for prosperity, so our goal is of course also to aid this process by doing what we do best. If we can create a captivating building that can add a small but important piece to the “Giant of Africa”—who wouldn’t what to succeed in that? Back to Europe, let’s talk about Copenhagen and the future developments in the city featured in the "Housing and Welfare - Homes | Ensembles | City” exhibition held by the Royal Danish Academy of Fine Arts and the Danish Building Research Institute. The projects on display include the master plan for Vinge, a new 350 hectare urban development you are working on north of Copenhagen. Can you describe the needs that gave rise to this, the central role of the railway station and the integration of the landscape with a new vision of living systems? With nearly 1,000 people moving to the Copenhagen area every month, there is an immediate and growing demand for housing. At the same time, people also want a green and healthy environment in which to live. Vinge tries to meet these various challenges by creating a new typology that is at once urban, sustainable and closely connected to nature. The project was an international competition published by the City of Frederikssund. The new Vinge Train Station has been designed to function as the heart of the new city. It plays a large role in unifying the movements of the landscape and the population. The station therefore functions both as a physical bridge and as a beacon for the area. Its non-directional, elliptical shape brings the surrounding spaces and functions together. The train station acts as a hub and provides convenient access to all forms of public transportation. This focus is just one of the many sustainable components of Vinge, as more people will be encouraged to take the train to work and school as opposed to going by car. Can you tell us more about the sustainability issues underlying the Vinge concept and plan? How can they concretely improve its inhabitants’ lives? We apply knowledge-based design approach to all of our architectural work. A great effort is put into collecting data, analyzing it and using the results as a basis for optimizing the design – this of course also applies to Vinge. The city is planned such that public, retail, commercial and residential buildings will have low energy consumption. The urban spaces are based on the existing climatic conditions to ensure that they become liveable and comfortable spaces for residents. This is really a green-field project, where we were presented with the unique opportunity of creating a city from the ground up. This increases the potential for integrating sustainable systems from the start – both in terms of economy, social value and environment. The plan is very robust and can be adapted to incorporate new state-of-the-art sustainable technologies as they are developed and made available.